78545 Hercules 52-inch Reversible Five-Blade Indoor Ceiling Fan Brushed Nickel. Online Electrical Supply Since 2003. Wall & Ceiling Bulkhead Lights. Wall Lights - Exterior Surface. MK Logic White Wiring Accs. Dry Lining Cavity Wall Boxes. 3093Y Heat Res 3 Core Flex. NYYJ - Tough Sheath Black PVC. Contactors 3 Pole AC With Coil. Contactors 4 Pole AC With Coil. Contactors 3 Pole DC With Coil. Direct On Line Motor Starters. Timeguard TOP2 DIN Rail Timers. Air Extract or Supply Valves. Hose Kits For Cooker Hoods. Ceiling Fans > Westinghouse Ceiling Fans. 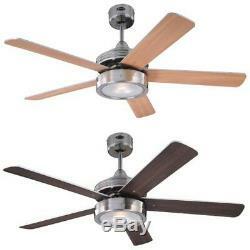 Hercules 52-inch Reversible Five-Blade Indoor Ceiling Fan Brushed Nickel. The Westinghouse Hercules receives high marks both as a modern accessory and as a sophisticated ceiling fan. The housing surface in brushed nickel, the flat luminaire with a glass pane and 5 reversible blades in weathered beech and maple give the Hercules a natural and harmonious design. A durable and virtually silent AC motor made of cold-rolled steel ensures comfort throughout the year: a comfortable cool climate in summer and optimum heat distribution during winter operation. Can be equipped with either a remote control or a wall switch. Recommended for rooms from 25 - 30 sqm. 132 cm ceiling fan for indoor use. Five blades in weathered maple/beech. Remote control or wall switch can be added. Ideal for rooms 25 - 30 sqm. Can be installed with or without a down rod (included). Additional down rod lengths are available. 60 watts at highest speed. 170 rpm at the highest level. Cold Rolled Steel Motor 153mm x 15mm. A Top of Canopy to Bottom of Blade (cm). C Top of Canopy to Bottom of Canopy (cm). D Width of Motor Housing (cm). E Width of Canopy (cm). F Top of Canopy to Bottom of Glass (inches). Dual Mount System - These versatile ceiling fans may be installed with or without the extension drop rods included in the packaging. This flexibility allows you to install the fan either close to the ceiling or at a lower level in rooms with higher ceilings. Drop Rod Only - Drop Rod ceiling fans. Installed with the Drop Rod supplied, you may replace the drop rod with rod's having a length of either 12" or 18". The option for a 12" or 18" Drop Rod varies for each model. Hugger - Specially designed for rooms with lower ceilings, hugger fans can not be installed with a down rod. This product has no reviews yet, however see what our buyers say about our other products.. Some small low value items may be sent by 1st class post. Return the item and include the completed form. Once we receive the faulty unit a replacement can be sent out after inspection/testing of the original. You may also be interested in.. Sign up to our Newsletter for the latest products and special offers! The item "78545 Hercules 52-inch Reversible Five-Blade Indoor Ceiling Fan Brushed Nickel" is in sale since Wednesday, July 22, 2015. This item is in the category "Home, Furniture & DIY\Heating, Cooling & Air\Indoor Air Quality & Fans\Ceiling Fans". The seller is "fastlec" and is located in Littlehampton. This item can be shipped to United Kingdom, Ireland, Germany, France, Italy, Spain.